Different versions of savoury pancakes are popular in Asian cuisine, including Korean pancakes, Japanese pancakes, and Chinese pancakes. 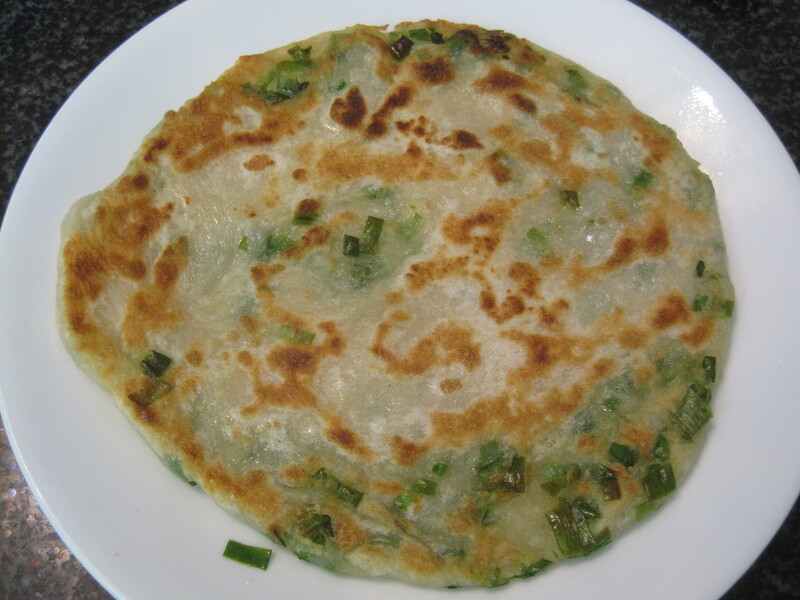 My favourite is the Chinese scallion pancake that is believed to have originated in Shanghai. Considering these pancakes are made with flour and green onions, I have always found them to be overpriced in restaurants. Luckily, they are very easy to make. Although they are slightly time consuming to make, you can make a large batch and freeze them for quick and easy future meals. These make a great accompaniment to all sorts of dishes, but especially to stir fried Shanghai noodles (see recipe here) and sticky rice rolls with pork floss (see recipe here). Place the flour and a pinch or two of salt in the bowl of a food processor. You do not need to add salt if you’re using chicken broth instead of water. Then with the food processor motor running, gradually add 1 cup of the boiling liquid in a thin and steady stream. Process the dough for up to 15 seconds. If the dough is too try and does not come together in a ball, then add more boiling water, 1 tablespoon at a time, with the motor running until the dough just comes together. Gather the dough and knead it a few times by hand on a lightly floured surface or silpat (silicone) mat until you can form a smooth ball. If you do not have a food processor, you could simply stir together the flour, salt (if using), and boiling liquid in a large, heat proof bowl. When the flour and liquid come together, dump it out onto a lightly floured surface and knead until satiny and smooth, about 5 minutes. Form the dough into a smooth ball. Place the ball of dough into a lightly greased bowl, cover, and allow it to rest at room temperature for 30 minutes. Alternatively, you could store this in the refrigerator for up to overnight. On a lightly floured surface or a silpat mat, give the dough a few kneads using your hands and then roll it out to form a long cylindrical log. Use a sharp knife or pastry cutter to cut the tube into 5 or 6 even pieces, depending on how large you want your pancakes to be. Roll each piece of dough into a smooth ball. Work with one ball of dough at a time. Use a lightly floured rolling pin to roll out and flatten a ball of dough until it is at least 4 inches, and no more than 8 inches, in diameter. 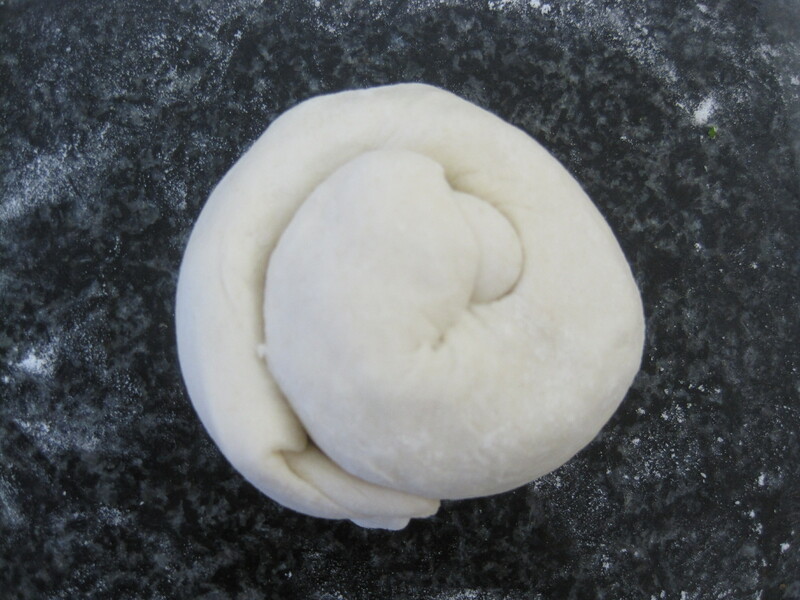 When rolling the dough, start rolling from the centre of the dough and move upwards and over the top edge. 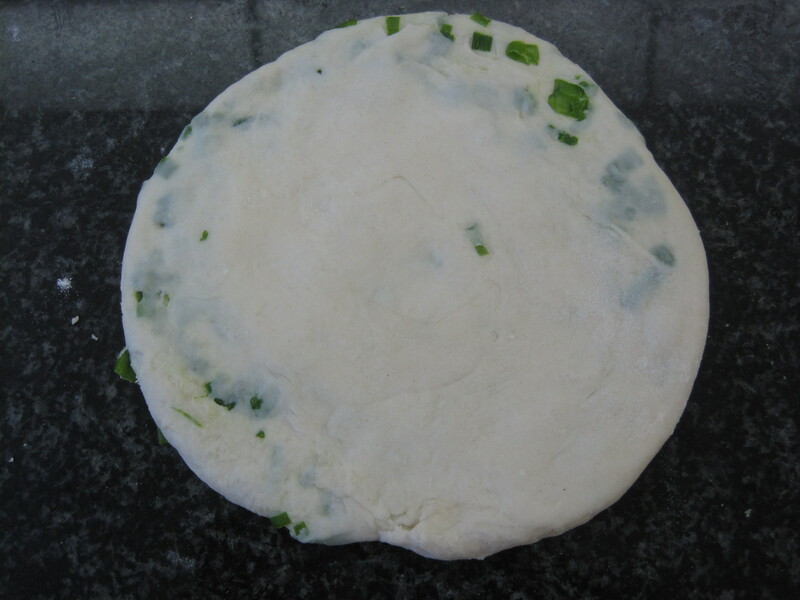 Then lift the dough, turn it 90 degrees, and continue rolling the dough from the centre to the top edge again. Continue until the dough is flat, thin, and circular in shape, and until the dough stops shrinking. 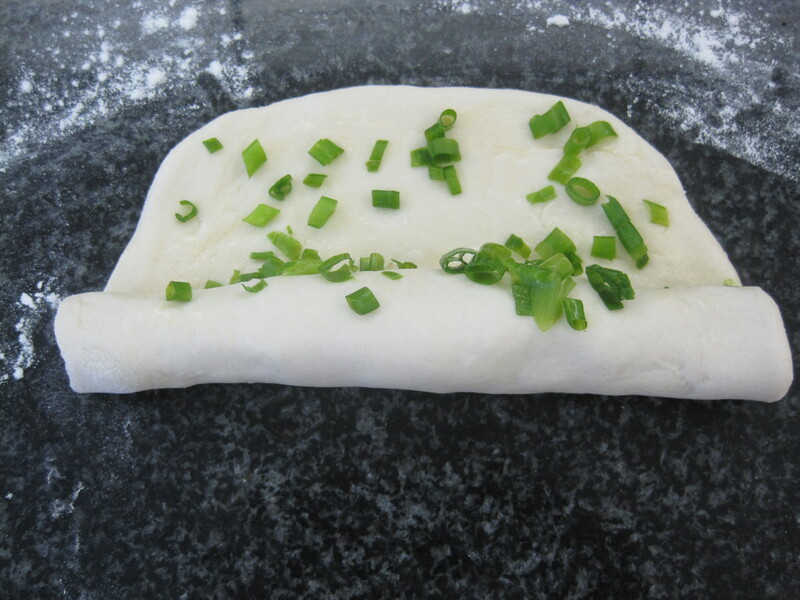 Brush a thin layer of melted lard or sesame oil onto the top side of the rolled out dough. Sprinkle over some thinly sliced green onions. Roll the dough up, semi-tightly, into a tube, starting from the bottom of the pancake. Then roll the tube up so that it forms a tightly coiled ball and use your fingers to pinch the end closed. Use your hand to gently flatten the coil. Then use a lightly floured rolling pin and work surface to roll the coil out into a thin pancake. 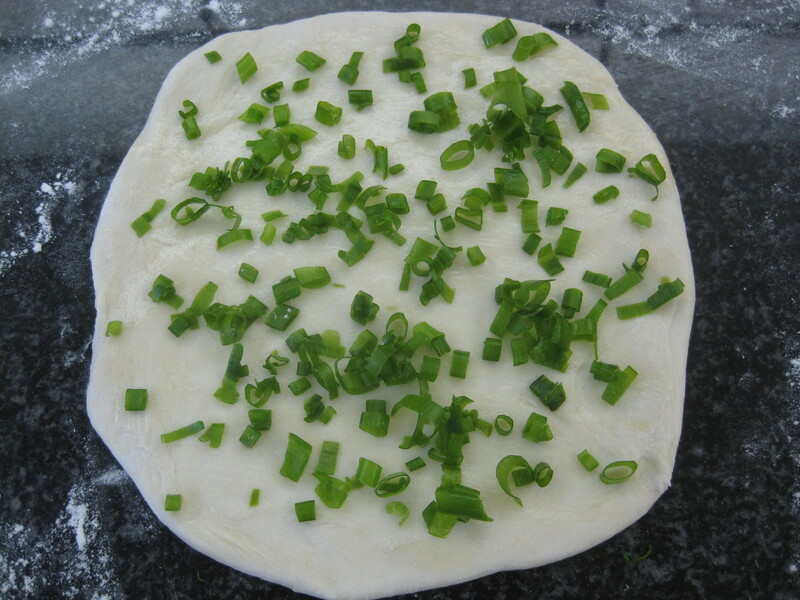 Brush a thin layer of sesame oil onto the top side of the rolled out dough and sprinkle over sliced green onions. Once again, roll the dough up into a tight tube and then spiral the tube around itself to form a coiled ball. Flatten the dough slightly with your hand and then roll it out using a lightly floured rolling pin. Your pancake should be at least 4 inches, and no more than 8 inches in diameter. Place this between two sheets of wax paper and set aside until ready to pan fry or freeze. Repeat these steps with the remaining balls of dough. If you are making these pancakes in advance, they can be kept in the refrigerator, uncooked, for up to 1 day. They can be kept for much longer in the freezer. Simply cook the frozen pancakes either straight out of the freezer, or after they’ve been defrosted in the refrigerator. When ready to cook the pancakes, heat a non stick skillet over medium high heat. Then add a few light drizzles of vegetable oil. Once the oil is hot and shimmering, but not burnt, carefully place a pancake into the hot oil. Cook until the dough starts to become translucent and the bottom side is nicely browned and crispy, about 2 minutes. You may need to reduce the heat if your pancake starts to burn too quickly. Then flip the pancake over and cook until the second side is nicely browned and crispy as well, about 2 minutes. Remove from the pan, season with more salt if desired, cut into 4 or 6 wedges (depending on how large your pancake is), and then serve immediately with chinkiang vinegar on the side as a dip. These pancakes are best enjoyed fresh out of the pan and still very hot.